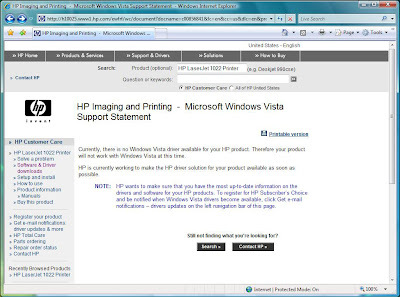 MPECS Inc. Blog: Windows Vista - HP Driver not available? Grrr, I'm having the same problem. Just upgraded to Vista, and I can't print with my Laserjet 1022n. How did you 'force' the XP driver? Did it work? Yes, the XP driver is working so far. I don't have any screen shots, so pulling from memory. Have the driver CD in the drive, and point the driver install to the WinXP folder. Make sure Vista accepts it, and it should recognize the printer. Sorry I can't be more clear. I will make a point of taking some shots and updating the post as soon as I run into this again!